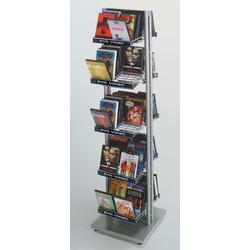 This space saving standing DVD fixture has five tiers per side for a total of ten display shelves. Dual sided design allows products to be seen from either direction and several pockets are designed to hold several selections at once. The tiered design makes the customers browsing experience much simpler. This DVD fixture is built from high quality materials for added durability.